HEIMISH All Clean Balm is an oil cleansing balm that is formulated with Coconut Extract, Shea Butter, Citrus Herb Oils and a White Flower Complex to completely remove all impurities and makeup with ease. This is one of the most loved Korean cleansing balms. If you purchase this product you will earn 4-26 Points! This oil cleansing balm will remove heavy makeup as well as effectively cleanse dirt and impurities without stripping your skin of its natural oils. Coconut Extract and Shea Butter work to moisturise, protect and soften your skin. Citrus Herb Oils such as Grapefruit and Orange Peel Oil, Tea Tree Leaf Oil, Lavender Oil and Bergamot Fruit Oil help brighten your complexion in addition to soothing irritations. A White Flower Complex consisting of Jasmine, Daffodil, Rose and other flower extracts balances your skin whilst improving skin tone. 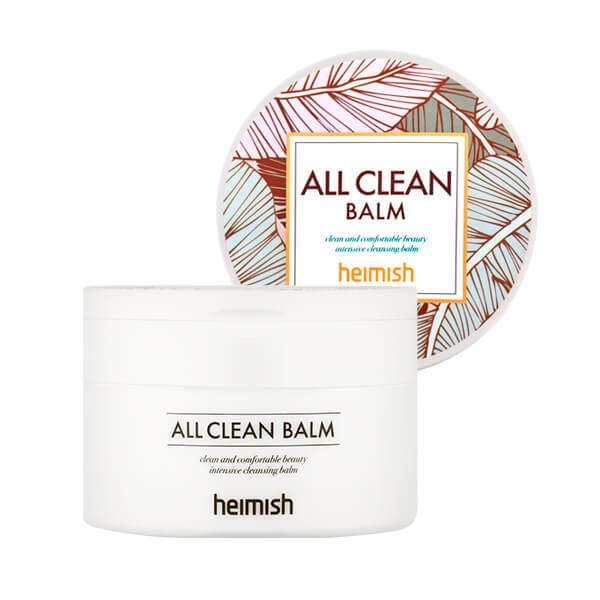 Heimish All Clean Balm has an all natural formula that provides a deep cleanse without causing irritation. Free from: Parabens, Artificial fragrance & Artificial colourants. Using the spatula provided, apply an appropriate amount of product onto dry skin. Gently massage in a circular motion using clean, dry hands. Add a splash of water to emulsify the balm into a milky texture and continue cleansing.